If you have used a flash memory card or USB device, I am sure you have noticed the "Speed up my system" item in the AutoPlay pop up that is displayed when the system recognizes the device. Every time I have clicked on the "Speed up my system" item in the past, I have been told that the device does not have the required performance. I performed some brief research on Tom Archer's Vista blog and found you need high speed flash memory. You need a device which supports 2.5MB/sec throughput for 4K random reads and 1.75MB/sec throughput for 512K random writes. The Lenovo X60 has an SD flash card slot, so I decided to use a SanDisk Extreme III card which boasts 20MB/sec read/write speeds. I could never find the basis for the published performance numbers, what block size they used and whether it was based on random or sequential operations. My suggestion is to go for the highest performing flash memory you can find. In the SanDisk product line, that would be the Extreme III. I found inexpensive ones on eBay, a 2GB Extreme III card can be had for less than $15 and 4GB for less $30. You should match the flash memory size to the amount of memory you have installed in your system. I just upgraded my X60 to 4GB of memory, so I purchased a brand new 4GB SanDisk Extreme III card for $26. The ReadyBoost properties display for my SanDisk Extreme III card. I used the recommended 3780MB reserved space. 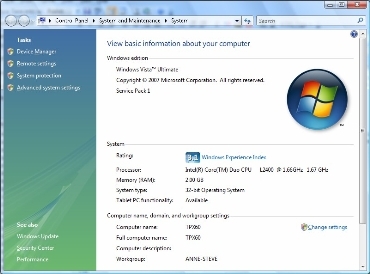 This is a simple and inexpensive to improve you Vista performance. Tom Archer also has posted an FAQ of information he gathered from the Windows Client Performance team. Office 2007 Word has been quietly updating the blogging feature. This is my first real post with it and it looks like we are at a point where it is really usable. The selected 5 My Faves numbers are tied to the phone and not the account. The bottom line is that you can't share My Faves number across your Family plan (too bad). Once the My Faves numbers have been validated by the phone's My Faves application, you can swap your SIM card into a phone which does not have the My Faves application (like the iPhone). Your calls to your My Faves numbers still count in you My Faves unlimited bucket. You can only modify My Faves numbers once a month. The message I received was that I could change them on June 1. I received my Fujitsu U810 and so far I am very impressed with its build quality. It is not the fastest machine (it gets a 2.1 Vista processor score), but I think it works quite well for web, email and text processing. The tablet functionality works very well (this one area where Vista shines). The size and weight are just about perfect for my shoulder bag. I will be traveling soon and will report back on how useful this little machine will be. Working on a review of CellPoint's Flamingo Music earphones. I have decided to try a UMPC this month, the Fujitsu U810 to see how it might fit in with my travel gadgets. It is a Tablet PC with Vista that has a 5.6" screen and weighs 1.56lbs. This would definitely solve my photo sharing dilemma since I could easily transfer files from my camera and upload them to the Kodak Gallery for sharing. Costco is currently selling the 40GB model with Vista Home for $849 and adds 1 year to the base 1 year warranty for free. It will be interesting to see how useful this UMPC is. My review of SBSH Mobile Software Facade application for pocketnow.com. should be published this week. This is a smartphone (Windows Mobile Standard) today screen replacement. Finishing on a review of SBSH Mobile Software Pocket Weather. In my Monday ramblings I mentioned rumors I had read about the potential big announcement of a MID, UMPC or tablet style computer by Apple at their World Wide Developers Conference in June. Now another piece to the puzzle. Intel is one of the primary sponsor of the BMW Formula One racing team; during a recent event at BMW new museum in Munich (BMW World) Intel's managing director was quoted in ZDnet Germany (thanks to Brandon at pocketnow.com for finding this one and translating it). "As part of an Intel event for the 40th birthday of the semiconductor company at Munich’s BMW World, Germany managing director Hannes Schwaderer confirmed today what has long been a rumor on the Internet: namely, that there is an iPhone with Intel’s new Atom chip. The device is slightly larger than the current version, Schwaderer said. 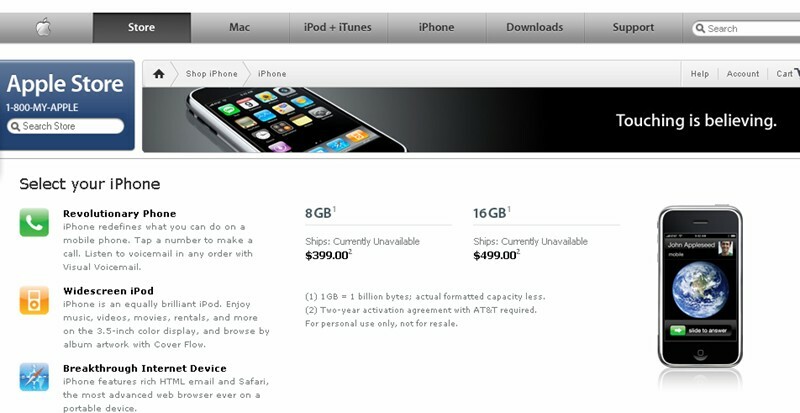 That is not, however, because of the Intel chip, but because of the larger display used in the new iPhone." The Atom chip is being used in many UMPCs including several Fujitsu models (currently on sale at costco.com). The cost of systems with these chips seems to be around $1000. I have been running SP1 on the X60 now for over 12 hours without issues. All of the Lenovo custom on screen displays work. It seems a little zippier but that could just be my imagination. The Windows Experience Index is the same at 3.1 because of the poor graphics performance, this tablet was not built for graphic so it is not an issue. The Windows Experience Index under computer properties. The X60 detailed scores reveals that the 7200 RPM hard drive does the job with a score of 5. The XPS 720 detailed scores are obviously much higher than the X60 with the Nvidia graphics being the star performers. The XPS 720 has been running fine with SP1 for almost a week now and the USB resume issue seems to be cleared up. I am glad I did not have to time manually upgrade the X60 to SP1. This morning I brought up Windows Update and checked for updates. SP1 magically appeared. I will be applying the update today. To recap, I had to install the new Intel Graphics driver pack version 1.58 (download link) in zip format (igdkmd32.sys version 7.14.10.1437) and the UPEK fingerprint reader driver pack version 2.9 (tcusb.sys version 1.9.2.111). I installed both drivers manually using update driver feature in the device manager (see my post here). Thanks to Mark and Kevin for posting the links to the updated drivers. Thanks to Kevin, I was able to download the right UPEK driver (version 2.9). Not sure how I missed that one. I installed it last night using the device manager upgrade function. The tcusb.sys version is now 1.9.2.111. The fingerprint sensor seems to be much more responsive, especially when the system comes out of resume. I tried to install the exe version of the Intel driver pack version 1.58, but it claimed that my system was not compatible. I then downloaded the .zip version of the driver pack (download link). Unzipped it and followed the manual update instructions for the graphics driver found here. I am now running version 7.14.10.1437 of the 945 graphics driver. Currently under Vista without SP1 my brightness bar does show up when I press fn + Home. 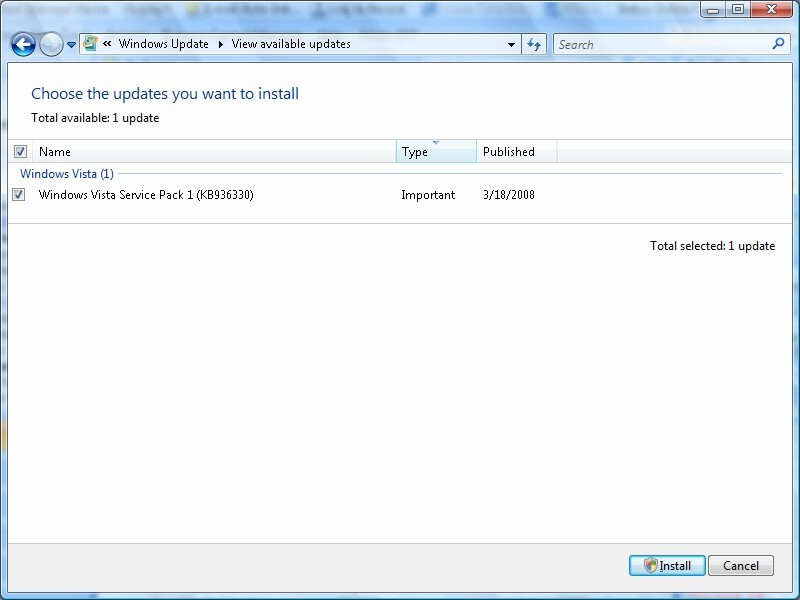 I then ran Windows Update hoping to get the SP1 update to show up. It found a newer Intel graphics driver, when I went ahead and installed the driver I was reverted to 7.14.10.1329, so I went back and manually installed 7.14.10.1437. 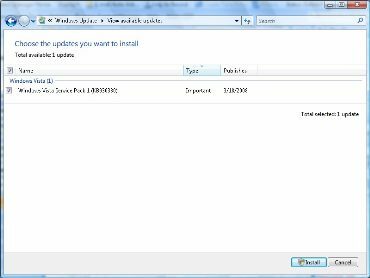 Re ran Windows Update, same message no SP1. I then went back to the MS KB 948343 (link) to install and rerun CheckSUR to make sure that the Windows Update search is not corrupted. No errors were found. Re ran Windows Update, same optional update for the Intel Graphic driver. I wonder where they check for version since 7.14.10.1437 is clearly newer than 7.14.10.1329. I may install the SP1 update manually tonight, if I have time. I use OneNote regularly on my Lenovo X60 tablet as well my Dell XPS 720. OneNote has an excellent synchronization feature which allows you to sync notebooks between machines. In addition to note taking, OneNote is great way to store web content. You store web content by printing to the OneNote virtual printer. Last week I went to print a page to OneNote on my XPS 720 and found the virtual printer missing. After unsuccessfully trying to manually recreate the virtual printer, I started searching for a solution. I was happy to find the UPEK version 2.3 driver yesterday. Along with the Intel driver I thought I had the pieces I needed to install SP1. Well the UPEK driver version 2.3 is not really 2.3. The tcusb.sys file for x86 Vista machines is version 1.9.2.71 which is actually older than the one provided by Lenovo. My tcusb.sys file on my X60 is 1.9.2.99. My Dell XPS 720 is working fine since the SP1 upgrade and the USB drive issue (blue screen on S3 resume) seems to be fixed. On the ThinkPad X60 front, Mark (comment from Part 2 post, thanks Mark) found the Intel driver for the 945 video chip set that is compatible with SP1, however the intensity display bar did not seem to work (probably a Lenovo customization) which is not a big deal. Now all we need is the appropriate UPEK finger print reader driver and I will be ready to try it. Update: I just did a search on UPEK driver and found a version 2.3 driver here. I am not sure whether it works on the X60 or not, but I may try tonight.